This hat is adorable for this Spring, Easter and Summer!!! I love it....I think you will, too!! 1 Skein Worsted Weight (Aran) Size 4 Acrylic Yarn in Cream (I used Loops & Threads "Impeccable" Worsted, distributed by Michaels Stores, Inc.
***Important: Be sure to Turn at the end of Rows 1 through 10. Do not turn at the end of Row 11. Round 3: *1 hdc in first st, 2 hdc in next st*. Repeat from * to * around. Join with sl st to first hdc. Ch 1. Turn. Round 4: *1 hdc in each of the first two st, 2 hdc in next st.* Repeat from * to * around. Join with sl st to first hdc. Ch 1. Turn. Round 5: * 1 hdc in each of the first 4 st, 2 hdc in next st.* Repeat from * to * around. Join with sl st to first hdc. Ch 1. Turn. Round 6 - 10: 1 hdc in each of the stitches around. Join with sl st to first hdc. Ch 1. Turn. Round 11: 1 hdc in each of the stitches around. Join with sl st to first hdc. Ch 1. DO NOT TURN! Round 12: *1 fphdc in first st, 1 bphdc in next st*. Repeat around. Join with sl st to first st. Fasten off and weave in loose ends. Round 1: Using "Magic Circle" 5 sc, join with sl st to form circle. Round 2: (This round forms the round of 5 "petals".) Sl st in first st. *Ch 2, 4 dc, ch 2* in next st.* Repeat from * to * 4 more times. Sl st in space between last and first petal. Fasten off. Weave in loose ends. 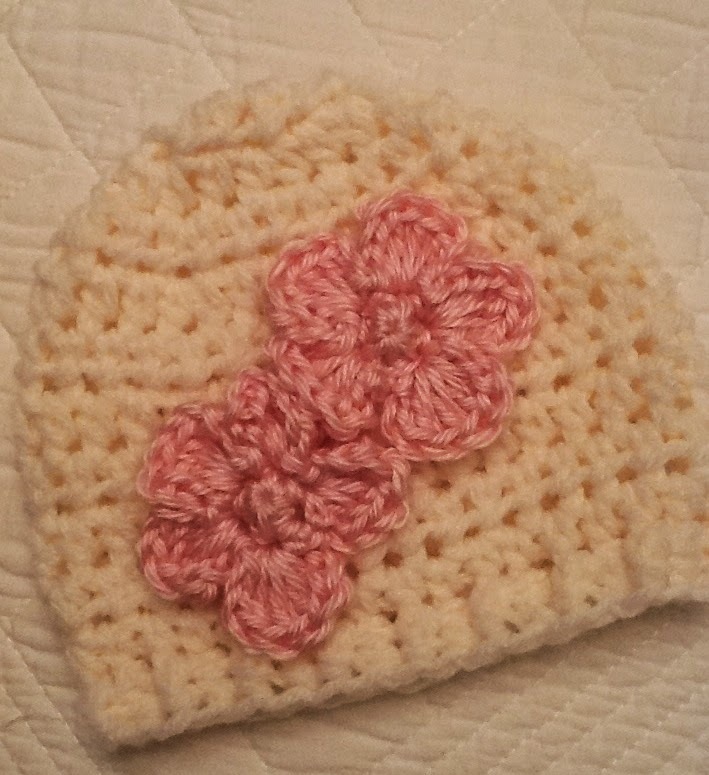 Sew flowers to the beanie! Enjoy! Pictures of your baby wearing this hat will be So-o-o-o-o Cute!!! This is a very cute and quick pattern. I think there is a mistake in round 5. Round 5: * 1 hdc in each of the first 4 st, 2 hdc in next st.* Repeat from * to * around. Join with sl st to first hdc. Ch 1. Turn. I think it should be *1 hdc in each of theach first 3 st, 2hdc in next st* I tried it twice as written and couldn't get it to work. Doing it this way came out just right.